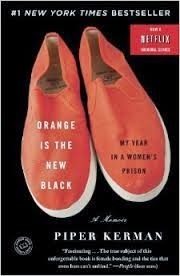 a book chick: "Orange is the New Black"
my take: Whilst visiting Daughter and her Bebe back when he was a wee thing, we decided to try the first episode of "Orange is the New Black" on Netflix. Hmmm. Quite shocking to sit and watch that with your kid, no matter how old she is. I didn't look for another episode, even though I'd heard such a great interview with the author. Fast forward a year and there is a copy on BFF's bookshelf. What have I got to lose if it's free? Piper is a Smith College graduate who got involved in the outer edges of a drug ring. Years after her illegal activity, she is discovered and, with the help of a great legal team, gets only a year in prison. The memoir is her education, transformation, and redemption through her incarceration in Danbury Prison Camp in Connecticut. She introduces the reader to the rules and language of prison life and the people --women and guards--with whom she does time. "I thought I knew why Levy had lied. She didn't want to admit to herself, let alone to the outside world, that she had been placed in a ghetto, just as ghetto as they had once had in Poland. Prison is quite literally a ghetto in the most classic sense of the world, a place where the U.S. government now puts not only the dangerous but also the inconvenient--people who are mentally ill, people who are addicts, people who are poor and uneducated and unskilled. Meanwhile the ghetto in the outside world is a prison as well, and a much more difficult one to escape from than this correctional compound. In fact, there is basically a revolving door between our urban and rural ghettos and the formal ghetto of our prison system." This book informed me and made me think. Think hard. And want to act. my take: PROFOUNDLY MOVING. great read. Very interesting. I watched the rest of that first season but couldn't get past episode 1 of the next season. I've heard such great interviews with this author as well as the show's creator and various actresses though. And the show (while making a girl like me rather squeamish over a lot of things) also did make me think quite a bit about these issues of race/class, how we treat people on the margins of society, etc. The book sounds good.